One obstacle to its popularity is that its hallmark ingredient is unavailable. The Brooklyn, like the Creole, calls for Amer Picon as its bittering component, and Amer Picon—at least in its original formulation—isn’t available anymore. The best you can do is to emulate its flavors to get the gist of the original cocktail. And I’m okay with emulated ingredients. The idea that you can’t make a serviceable Brooklyn without Amer Picon seems pedantic at best. In fact, the absence of original Amer Picon isn’t really too much of a loss, since, with thoughtful substitution, we can still make a cocktail with the same flavor notes as the original, one that respects the intent of the drink’s inventor. And it’s pretty easy to substitute for the earthy, bitter, orange flavors of Amer Picon. Grohusko’s 1908 formula called for equal parts rye whiskey and Italian vermouth, with a dash each of Maraschino and Amer Picon. It’s a very good drink, very Manhattanesque, though a bit on the sweet side with such a heavy proportion of sweet vermouth. Such were the tastes of the times. But something curious and unfortunate happened almost immediately, and as sometimes happens with bad ideas, it stuck. Bartender and cocktail formula publisher Jacques Straub seems the likely villain in this tale. Only six years after the Grohusko’s first publication, Straub picked up his Brooklyn recipe for his 1914 Drinks manual, and inexplicably changed the Italian vermouth to French vermouth. The 1908 edition of Grohusko’s book had called for Ballor Vermouth, and it’s possible that Straub was unfamiliar with the brand, and assumed it was a dry vermouth. Or it’s possible that it’s just a typo. Or maybe Straub actually liked the Brooklyn made with dry vermouth. Whatever the reason, it’s this French, or dry, vermouth version that’s been bandied about ever since, all but immortalized by its inclusion in Harry Craddock’s ubiquitous Savoy Cocktail Book . Sweet vermouth and rye whiskey are very good partners; dry vermouth and rye, on the other hand, are not close friends at all. That’s part of the reason the Manhattan is a great drink, and the Brooklyn as we see it served today is just a forgettable also-ran. A Brooklyn made with dry vermouth seems thin and out of balance, with nothing to properly tie together the grassy and herbal traits of the vermouth with the wood and grain of the whiskey. It’s a silly drink. It’s time to lay such silliness to rest. Grohusko’s original (it’s not clear that he invented the formula, but he was the first to publish it), with its rounder, sweeter Italian vermouth component, relies on the same flavor combinations as the classic Manhattan—rye whiskey, Italian vermouth, bitters, and notes of cherry as a highlight. Fill glass with ice. Stir and strain. Serve. Stir with ice until very cold. Strain into a chilled cocktail stem. Originally served without garnish, but a cherry is an appropriate decoration. The whiskey and vermouth work well in a 3:1 proportion. I lean toward higher proof ryes like Rittenhouse, but softer whiskies also work in the Brooklyn. If you have a favorite rye for your Manhattans, it will work well here, too. 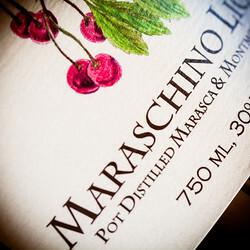 Leopold Bros. maraschino has a bright, clean, fresh fruit flavor that I’ve never encountered in other maraschinos, without being overly sweet. It is well worth adding to your bar if you can find it, and it makes a delightful contribution to the Brooklyn. A simple substitution of Ramazzotti and orange bitters, the same combination we used in the last post on the Creole, suggests the flavors of the unobtainable Amer Picon. The Brooklyn’s nose is sweet, with the cherry and maraschino coming to the fore. The initial taste is much like a heavily bittered Manhattan, rye-forward, with the earthiness and bitter notes of the Ramazzotti asserting themselves. 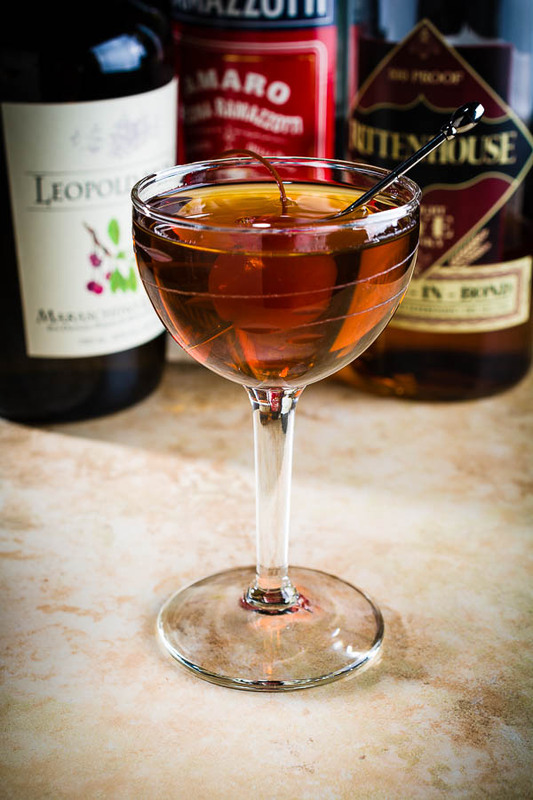 The aftertaste is long and sweet, a balanced blend of the rye, the amaro, and the cherry. There is a very similar, modern riff on this original Brooklyn flavor combination called the Red Hook. It’s been around since 2010—about a hundred or so years younger than the original inspiration—and I recommend it as an alternative if this flavor mix appeals to you. But there’s more to the Brooklyn’s flavor profile than we encounter at first glance. There’s the question of what kind of whiskey Brooklyn bars might have been serving in the early years of the 20th century. It’s possible that the 1908 Brooklyn was even more different than the version I’ve listed here, and that’s something we’ll look at next time. Until then, I’m glad, at last, to have a version of the Brooklyn that’s worth drinking. “In for Repairs: the Brooklyn Cocktail” at cold-glass.com : All text and photos © 2018 Douglas M. Ford. All rights reserved. Fascinating to learn of the unfortunate switch from Italian to French vermouth. Thanks for helping correct things. I don’t quite follow the transition to the Bronx cocktail at the end – what’s the connection? That was just my brain jumping the rails, followed by sloppy editing. Fixed now, thanks for letting me know. Glad you enjoyed the story. Great post! Have you tried it with a white vermouth, e.g. Dolin blanc? Might be an interesting middle ground. A couple years ago I made Jamie Boudreau’s Amer Picon facsimile, which seems like a fine substitute. There was a limited release of the Bigallet China China here in Ontario and I was able to snag a bottle – it is excellent and I would recommend that if you happen across it, pick up a couple bottles. I agree, lots of alternatives. And since I happen to have some Meletti, I’ll give it a try. Thanks. Yes, it’s definitely a close relative of the Manhattan. I envy that you can get Picon; it would be interesting to try, even if it isn’t the same as the 1900s–era formula. I’m curious if you have had the chance to try Golden Moon Amer dit Picon and your thoughts. I have used that with my dry vermouth versions and have enjoyed it, and am now excited to try with the sweet vermouth version. A question on your spec, 2.5 oz/75m seems rather large. Since I just found your site, is this closer to your preferred size for all recipes or to provide more manageable quantities of your smaller ingredients? This is absolutely beautiful, definitely one to try making at home! Thanks for the recipe. I find that with sweet vermouth, the beauty of the Amer Picon-Maraschino duo interacting with the rye whiskey is less notable. Also, I prefer a mellow rye closer to Old Overholt than fiery like Rittenhouse for this same reason. I also think that caramel and sweetness that Picon can donate to dry vermouth can make it similar to caramel-tinged sweet vermouth. In the middle is the Jim Meehan “sub blanc vermouth to make dry vermouth drinks taste better” idea. I’ve seen that substitution, and it makes some sense—but I keep forgetting to try it. Strictly from the historic point of view, it’s neither the “dry” nor the “Italian” vermouth that twentieth century manuals prescribe, but from a practical point of view, it’s the touch of sweetness that makes the flavors work for me, and it seems like it could work pretty well. Have you tried that substitution? 2oz Rye, 3/4oz Dry Vermouth (Noilly Prat), 1/4oz Nardini and a barspoon of Maraschino liqueur. I’ve not encountered Nardini, I’ll have to look for that. How would you describe its characteristics? Nardini is just about my favorite sipping Amaro. It’s not highly bitter like Cynar, more in line with Averna or Montenegro. It is moderately sweet, has a hint of orange fruitiness, and just a touch of mint (but nothing like a Fernet). Nardini and Gin is also a wonderful combination, makes a great Martinez style drink. I find a chocolate-mint note in Amaro Nardini and find some similarities with Benedictine but with a more black amaro caramel note. I’ve read at various places on the web that Amaro CioCiaro is supposed to be a close match to the original Amer Picon. I’d be interested to know if anyone who has access to it can try it & render an opinion. Thanks, Aaron, I’ll look for it. I have used the Amaro CioCiaro in the Brooklyn and enjoy that, taking it on faith from others that is as close to the original Amer Picon formulation as you’ll find (but Golden Moon is something that I’ll be on the lookout for). I like the cocktail, but have always been a bit perplexe by the dry vermouth ingredient—but reluctant to have it too sweet or Manhattan- like w/sweet vermouth. Like the idea of Dolin Blanc— will try it tonight! That’s not the only thing Straub cribbed from Jack Grohusko. The whole book is basically a crude abbreviation of Jack’s Manual. Especially note all the uniquely named recipes shared between them. The Brooklyn cocktail is near the top of my Rye & Bourbon home cocktail menu. I’m fond of the Golden Moon Amer Dit Picon and always have a bottle on the shelf. My wife and I have about a dozen different Amaros, so I’ll have to start playing around with them and my recipe. 2 oz Rittenhouse rye whiskey, 1 oz Cocchi Vermouth di Torino, .25 oz Luxardo maraschino liqueur, and .25 oz Golden Moon Distillery Amer Dit Picon. — stirred for 30 seconds in mixing glass filled with 1-inch ice cubes & served In a chilled coupe. I haven’t seen the Golden Moon Amer Dit at my retailers, I’ll watch for it. Thanks! Interesting mix, Paul, I look forward to trying it. Thanks.